The story of Christ’s baptism is the story of his showing himself to the world as the Second Person of the Trinity—the Son of the Father. We are told of the wonderful revelation of God as all Three Persons of the Trinity in this story: Christ coming out of the waters of the Jordan River, the Holy Spirit descending upon Him in the form of a dove, and God the Father speaking from the heavens above: “Thou art my beloved son, in whom I am well pleased.” This account of Christ’s baptism and the manifestation of the Trinity is given in all four Gospels and marks the beginning of Christ’s three year public ministry. 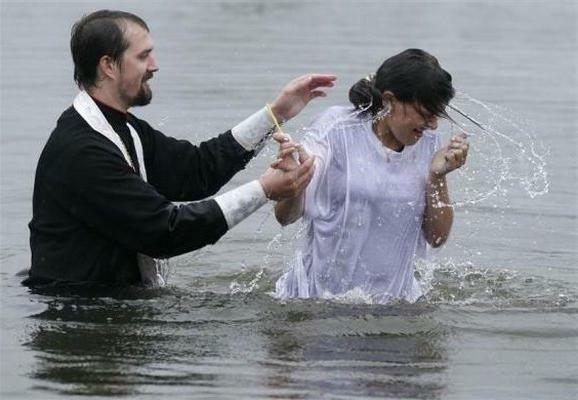 Our baptism (or chrismation) should not be seen simply as a one-time event, but rather as a milestone within our overall relationship with Christ and His Church. As with any relationship, our relationship with Christ and His Church develops over time, but it can be described in terms of four successive phases that a person goes through: the visitor, the inquirer, the catechumen, and finally the baptized, chrismated member. These terms may have been slightly different during different periods in the life of the Church, but the same basic progression has been followed since the beginning of the Church. The importance of reviewing this is that it not only serves as a reminder of how we arrived at where we are and what our Christian discipleship is as baptized, chrismated Christians, but it also reminds us of what stage those who come to us may be at in terms of their relationship with the body of Christ and how we might help them grow into Christ. Because we are describing a relationship, it might be helpful to describe these four phases in terms of human relationships: casual dating, committed dating, engagement, and marriage. Those who come to Church to visit for the first few times are like when one first meets someone and goes out on a few dates together. During this initial stage of casual dating, a person has some interest in another person and spends some time with that person to find out what they are like. In the case of a visitor, one comes to Church to see how things are done in an Orthodox Church, ask those various questions that come to mind, and basically see what things are like. It is a stage of addressing initial curiosity and interest, but there is no obligation or commitment on the part of the visitor to the parish. The priest is available to the visitor, extending the welcome of the parish to the them and willing to answer questions that the visitor might have. Ideally, a visitor finds enough in their experience of the Church to go to the next step in the relationship and commit to a regular, ongoing relationship with the church and become an inquirer. In our analogy of dating, this would be like going to the next step of committed dating. The person has moved past the first few casual dates with someone to dating them regularly. The inquirer comes to church regularly and focuses on learning more about the life of the Church and the Orthodox faith. It is a more serious relationship than simply visiting, but the inquirer is still under no obligations to the parish. The priest usually works with the inquirer through a formal inquirers’ class or a more informal process of occasional meetings and self-directed reading to provide the inquirer with an overview of the Orthodox faith. After one has been an inquirer for a while and has become informed about the faith of the Church, they will eventually decide if they want to transition to becoming a catechumen. At this point, the inquirer is expressing their intention to formally join the Church and their desire to be prepared specifically to receive the sacraments of baptism and/or chrismation. In our relationship analogy, this would be like becoming engaged, expressing an intent to become married and starting preparations for the wedding. One significant change at this point is how the person relates to the faith of the Church. The person moves from primarily seeking information about the Orthodox faith and life in the Church to seeking formation by the Orthodox faith. The emphasis is less on learning knowledge about the faith to living into the faith as a part of the parish. The catechumen, under the guidance of the priest, begins to follow a personal prayer rule, the fasting practices of the Church, gives regularly to the parish, and attends services on a consistent basis. Because of the seriousness of this relationship and the habits being formed during this time, our Archdiocese specifically sets one year as the period of time that a person must be a catechumen. Once the catechumen has gone through this period of formation, they are baptized and/or chrismated by the priest. This would be analogous to one’s wedding day and entering into a lifelong marriage. During this service of initiation, the catechumen is sacramentally joined to the body of Christ as one of its members. At this point, they become a baptized, chrismated member of the Church. Like a marriage, the baptized, chrismated member does not simply stop their growing into their relationship once they have joined the body of Christ. They will continue to deepen their relationship with Christ through those practices they began as catechumens: following a personal prayer rule, observing the fasting practices of the Church, giving regularly to the parish, and attending the services of the Church on a consistent basis. Also, by virtue of their chrismation, they will partake in some ministry of the Church, extending the work of God’s Kingdom into the world. What I have described in these four phases has focused upon the specifics of how a person interacts with the life of a parish over time. I need to make the important point that we, as Orthodox Christians, believe that the local Church is the Body of Christ. We are not simply talking about the formalities of joining an organization. Rather, we are talking in a specific way about growing in our relationship with Christ Himself. As we each reflect upon our own experiences of baptism and chrismation, we will find those fruits of our faith that we can share with those around us with enthusiasm. We have made the choice to be here. Why? There is something compelling there for each of us and we can share that with those who aren’t with us yet. In closing, I want to share with you something recently read of a Muslim refugee in Athens who underwent great hardship and sacrifice in his life before deciding to be baptized Christian. After his baptism, this man said he felt like standing in the center of the city and shouting to everybody, “I belong to Christ!” What do we have like that in each of our lives? Amen.